“If you have a connection, you can make two connected circles with your fingers,” said Midwest Food Connection Educator, Emily Houser, to a group of kindergarteners at Thomas Lake Elementary. The class, squirming in their seats with the excitement of learning about potatoes, could barely contain their energy. 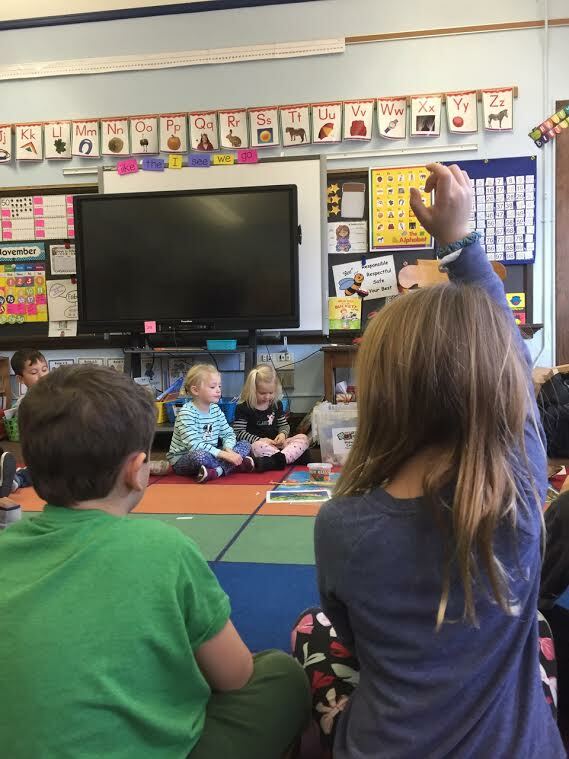 As waving hands became replaced with interlocking fingers signaling their personal connections to the lesson content, Emily called on some of the students who were eager to share their own experiences with potatoes. “I had mashed potatoes for Thanksgiving!” one student said. “I had sweet potatoes with marshmallows and cranberries. I really liked it!” said another. And the answers continued. Over the course of the two weeks I have spent as an Extern with MFC staff in classrooms, moments like these were common; not only was it evident that the students were grasping the lessons, but they were excited about them. Each set of interlocking fingers and each new classroom brought a unique perspective and a lot of energy to the lessons that were taught. Now, the kindergarteners from Thomas Lake also know that potatoes are root vegetables, and that people long ago would store potatoes in their root cellar and eat them every night in the winter. And they sang a song about it! The second graders to whom Molly taught the Local Long Ago lesson at Horace Mann Elementary now understand that there are four words ending in “-ing” that helped people in Minnesota long ago find their food: hunting, gathering, fishing, and growing. In the time of one hour, the kids began to make connections that span hundreds of years, gaining a fuller understanding of where our food comes from and why that might be important after listening to the story of Nishiime and the Sugarbush. And following Haruko’s lesson on wild rice, students at Highland Park Elementary learned about this tasty grain through an important story about Winnebozho, and a unique history that predates the creation of the United States. While each of the lessons I accompanied MFC staff to touched on a different topic, the kids were unanimously excited to explore their personal connections to food, intertwined finger circles abounding. Not only did I see these personal connections to food in the classroom, but I also saw the power of food to create larger connections within the community. When I accompanied Emily to Richard R. Green Central Park Elementary, we taught the kids a lesson about root vegetables in the winter followed by an interactive preparation of vegetable stew. The kids cut leeks, tore kale and drew pictures of root cellars while their parents, in a separate room, learned how to cook a new meal for dinner. At the end, the two groups came together to share what they had learned and prepared. Not only were these kids able to understand new types of food and where they come from, but they were able to share the experience of learning and eating with their peers and then with their families. Through exposing students to the “dos” of how to approach food, Midwest Food Connection is fostering a healthy and positive mindset that extends beyond the classroom and impacts these students at a personal and community level. It is without a doubt that there will be many more connections to come. A huge thank you to Midwest Food Connection for allowing me to experience a wonderful organization!